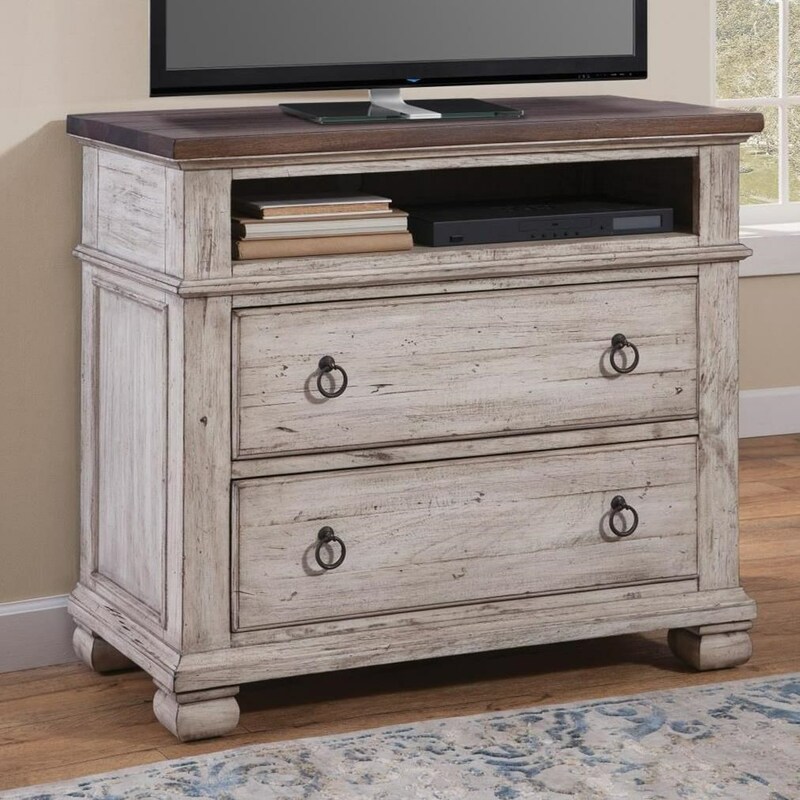 This charming media chest is a great way to add media storage to your bedroom. 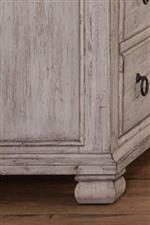 The piece features two drawers and an open compartment ideal for a cable box and other consoles. 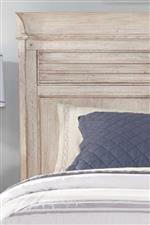 Ring pull hardware and a two-tone finish give the chest its warm farmhouse look. The Belmont Media Chest with 2 Drawers by Napa Furniture Designs at Zak's Home in the Tri-Cities, Johnson City, Tennessee area. Product availability may vary. Contact us for the most current availability on this product. Finish Pieces are finished in a distressed white with a seventeen step hand sanded, hand rubbed, and hand stained process producing a deep rich grain quality finish. Storage Two drawers and one open media compartment. Drawer / Shelf Construction Drawers feature English dovetail, corner blocks and mid-drawer support for strength and dust-proofing to protect your clothing. Case Construction Furniture is constructed from plantation grown, sustainable Indonesian forest hardwoods. All wood is double sealed before assembly to insure correct and consistent moisture content. Mortise & tenon and corner blocked construction provide a strong hold. Whether you're looking for farmhouse chic, relaxed vintage or aged cottage style, this bedroom collection is bound to impress you. This collection features a two-tone, distressed finish that pairs weathered white with medium brown, creating the perfect combination that will blend with a variety of color palettes. Offering enough storage to fit your needs, this quaint bedroom collection will make a great addition to your home. The Belmont collection is a great option if you are looking for Relaxed Vintage furniture in the Tri-Cities, Johnson City, Tennessee area. Browse other items in the Belmont collection from Zak's Home in the Tri-Cities, Johnson City, Tennessee area.